How do they work? 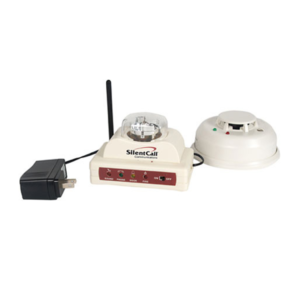 The products in this section are specifically designed to alert deaf and hard of hearing people to emergencies such as fire, carbon monoxide, and severe weather. They use low frequency audible alarms, strobe lights and/or bed shakers to make sure you and your family stay safe in the event of an emergency, no matter how severe your hearing loss! T3, T4 and Continuous Sound: T3 sound pattern is the beep-beep- beep-pause sound found in most smoke alarms. It has been the required alarm sound for residential homes since 1996 and the only alarm sound we sell. A continuous smoke alarm’s siren continues to play without pauses and would be present in older alarms. The T4 sound pattern is found in CO alarms that make a beep-beep-beep- beep-pause sound. Many states have requirements for CO alarm installation and we recommend checking your local regulations. Battery Back-up: Products with this symbol have battery back-up, which can keep you safe even during a power outage. Battery back-up works only for the audible aspect of the alarm unless otherwise specified. Click Here to view all of our Emergency Products.